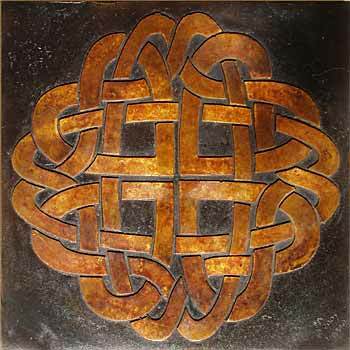 Size: 8" x 8" X 3/16"
Size: 6" x 6" X 3/16"
This is the second bronze tile with hearts as the core of the design. 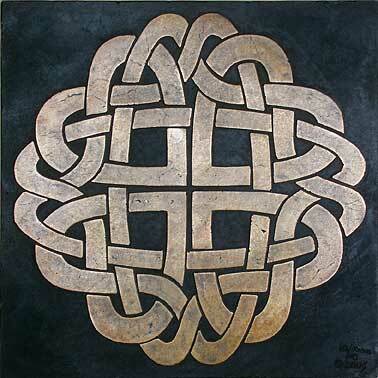 This one, though, is made from a single strand, whereas the Four Heart Knot is a double strand knot. Also, this is a rounder design and so can work well either straight or diagonal, with square or curved surroundings. The unity of this knot makes it special and the focus being where they all meet forms a cross, which can be of significance to those that like to see such things. If this is the tile you choose to enhance your hearth, kitchen, entrance way, driveway, or living room wall, I'll need to know how you want to set or mount it so we can work out any of those details ahead of time. The base thickness of this tile is about 3/16" and typically is flat on the back. Stubs, tabs, or threaded rod can be added on the back to bring it out to any thickness desired for $10 each, up to 2" long, but I'll need this information before it's cast. For further information concerning your particular application please refer to the information on the Bronze Tiles page to see if this answers your questions, and if not, please feel free to email me at michael@enchantedcreek.com. Special orders and commissioned work are more than welcome. Thank you for your interest and appreciation.